my doctor recommends both diet and exercise, and while my crustaceans always get live food, i don't have them in an exercise program. i recently stumbled upon the movie below and wondered if this is some form of animal cruelty, or should i be doing this with my crayfish and fiddler crabs? Indeed, this is animal cruelty: This poor shrimp is being subjected to a strenuous physical activity without basic consideration for its person. While exercise is a good idea for any animal, the way in which it is executed here is not ideal. There are better ways to exercise your cray, shrimp, or crab. The issue: Where are the jams? Music is a great motivational tool when exercising. From the jogging revolution of the late Seventies with spandexed yuppies polluting the streets listening to their Walkmans to today's youth cavorting about campus equipped with their slick, shiny iPods, music is a nigh-universal animus for working out. So what is to be done with your small family of fiddler crabs? What kind of music should you blast into the tank while you force them to run for miles on end on their little treadmill? It's hard to gauge a crustacean's taste in pop culture, so it's best to keep it simple and play something you know it will appreciate. This leaves only one choice: the all-time greatest workout track ever: The Final Countdown. In this futuristic rock track, synthesizers and men in strained falsetto deliver a rousing anthem that has driven many an athlete to the next level. Your crabs and crays can march straight to Valhalla on their treadmills, hearts pumping pure adrenaline through their little spiny bodies as the lead melody repeats throughout the song. After an hour or so on the treadmill, they can raise their tiny claws in the air, cutting through the pain barrier and reaching a natural high they just can't experience sitting under a rock all day. To illustrate the point, here's a video someone made of their shrimp's daily training regiment. Note the exertion and endurance as well as the use of its pleopods (swimmerets) as it practices for the International Crustacean Marathon later in the year. I just read about a weird crustacean in Borneo that lives underground and looks like a cross between a lobster and a shrimp. Do you have any information about it? What is it? Where does it come from? This strange crustacean near the city of Kota Kinabalu on the tiny island of Borneo baffles scientists with its unusual morphology. The static claws, for instance, are three times longer than the mobile claw appendage. Most crays have claws that are roughly the same size or at a one-to-two ratio. It is also able to snap its claws so hard it makes an audible clacking sound, much like a Mantis Shrimp. Another distinguishing feature is its tail, which is long and gangly and is incapable of the characteristic cray/lobster tail-flip locomotion. 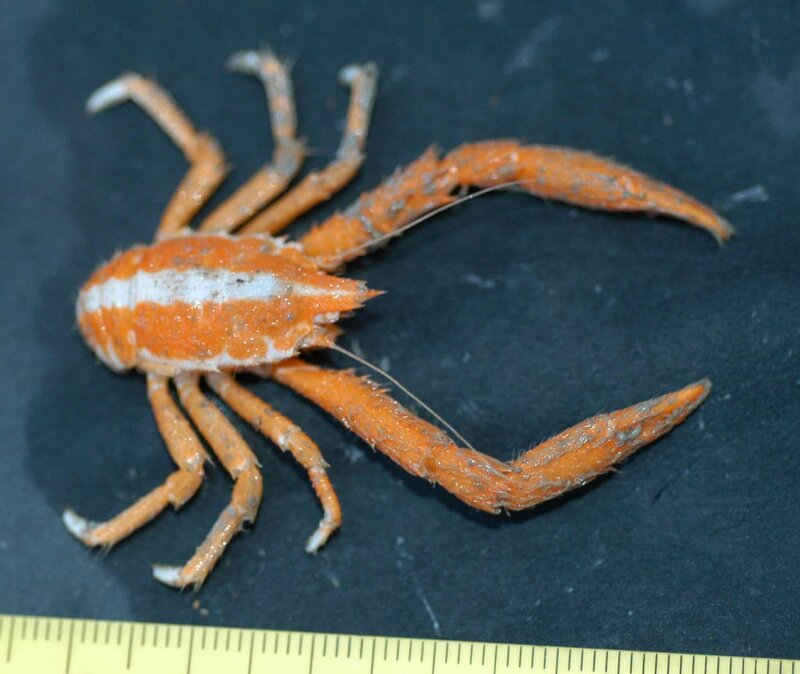 Natives, who gave this mystery crustacean its name, say the crature is familiar but elusive. The indigenous population have long held modern buildings and technology to be an offense to the spirits of their ancestors. In order to take revenge, their ancestors' spirits arise from the mud in the form of these strange crustaceans and attempt to cut the city-goers' fingers off. Indeed, the name of the city, Kinabalu, means revered place of the dead in the local tongue. Strangely, scientists have not been able to extract DNA from the animal for genetic testing and everyone involved in the capture or study of specimens has died under mysterious cicumstances. What do you guys think of keeping shrimp and crabs together? I was very close to buying some "mini crabs" from petsmart today but when the lady was trying to catch one i saw a lot of them were dead and decided i should wait until they got in some healthy ones, or just go to another store. But anyways, should the two species of inverts be kept apart? I personally recommend mixing crustacean species to ascertain your own results on cohabitation compatibility. Many species are compatible and may actually complement one another, while others disagree spectacularly and engage in magnificent battles to the death. Regardless of the outcome, however, the only way to find out is to try! Crayfish are almost always aggressive to other species, and such creatures will trigger their defense behavior. That is, the cray will become enraged and try to tear its tankmate limb from limb. For instance, a fiddler crab (Uca sp.) stands little chance against a cray and will, within minutes, become a twitching stub devoid of legs at the bottom of the tank. Fiddlers are social animals and do not have the aggressive territoriality that the solitary crayfish does. Shrimp species are much easier to mix with crays, especially ones that lack enlarged chelae (pincers). 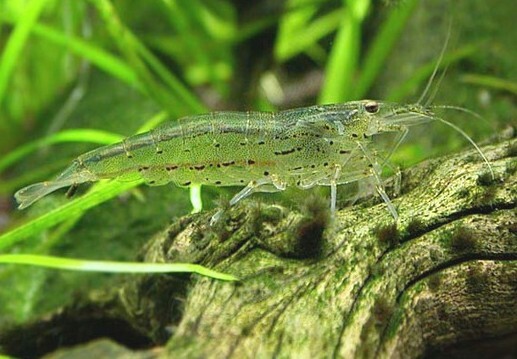 Ghost shrimp, also known as Glass shrimp, are sold cheaply in pet stores and forage for detritus. Crays will eat them if they're fast enough to catch one, though more often than not you will find the shrimp peacefully riding the cray, picking its shell clean of debris. In turn, the cray will eat the shrimp when they die. Other species are even more potential fun for cohabiting, however. For instance, the Shield Shrimp is an excellent addition to any tank with more than its share of slow, weak, or sick specimens. Fairy shrimp, brine shrimp, and daphnia are examples of smaller crustaceans that can serve as zoopankton for larger creatures. They also exhibit wonderful aquatic acrobatics as they wend to and fro in the swirling currents of your watery biosphere. Please share the results of your experimentation with us, preferably with hi-rez pics! I just bought a triops packet, i have no idea what it is but it says it's the world's oldest crustacean so i thought i'd ask you. they sell something called daphnia to hatch and raise for food, but the guy at the store said you can just let them eat one another. 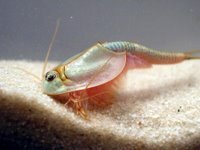 A usually unheard of but incredibly old type of crustacean, the Lazarus shrimp (also known as the the shield shrimp or triops) is the perfect kind of crustacean to introduce into your aquarium. It displays interesting behavior and gives you a glimpse into the past while at the same time entertains for hours on end with its antics. Diverging from other crustaceans early on, the modern form of the shield shrimp has not changed for 220 million years, making it quite possibly the world's oldest extant group. It is commonly believed to be related to the Horseshoe Crab, though this is not true. Their similar physical characteristics are due to convergent evolution, or one species liking the look of another and evolving to match it. Being so old requires being crotchety and the shield shrimp does not disappoint in this regard. Used to a short life in a rapidly-drying seasonal pool, the shrimp hatches within four hours of exposure to water and begins molting incessantly. It feeds on anything smaller than itself, so have plenty of sea monkeys handy. If sea monkeys can not be found, it is perfectly suitable to let the triops cannablize until only one, the greatest and strongest, is left in the tank. After natural selection has worked its magic, it's time to introduce your powerful triop into your community tank! Make sure there's nothing smaller than it in there, as it would prove to be an unfair fight. A crayfish of similar size would make for an excellent battle, and a dozen or so ghost shrimp will provide additional targets for both the cray's and the triop's predatory advances. In addition, they'll serve to help "clean up" the loser after the victor is done eating his fill. I suggest while your cray and triop get to know one another you film in high speed so that when played back, the creatures look large and slow. Filmed properly and with the addition of some monster movie music, you will have a short five minute clip begging to be uploaded to YouTube or Google Video. Perhaps you can title it something using their taxonomic names to make it sound exotic. For instance, Procambarus vs. Triops sounds like something any child would love to tune into on a Saturday morning. Good luck with your Shield Shrimp and please share the link to your monster movie once complete! I've heard about a weird new hairy lobster that lives at the bottom of the ocean. It's supposed to be a living fossil or something. Do you have the scoop on it? The Hairy Kiwa is unlike anything ever seen before. Found at depths of 2,300 meters near thermal vents, the Kiwa's pincers, legs, and antennae are covered in fine white celae, or hair. They're also blind, as the benthic deep offers little or no light by which an animal could navigate. In fact, its eyes have devolved into an extra set of antennae for the creature. The Kiwa's body is also strange, its abdomen reduced but not merged with the thorax, as in primitive crabs. Theories abound regarding the animal's fur coat. One camp suggests the hairs are a way to collect and harvest bacteria, abundant in the warm waters near the vents. Other groups say that the animals use them as sensory devices to compensate for the lack of light. A third group suggests that the celae might have a role in mating, as one male was found adorned with sea shells and had used mud to arrange its hair into intricate patterns. Females sometimes remove some or all of their hair entirely in order to captivate males. The Hairy Kiwa's only know relative is the Squat Lobster, a member of the same superfamily and similar in body layout. It is thought that the two species are separated by 15 million years of evolution and are remnants of a lineage that eventually led to true crabs and their allies. 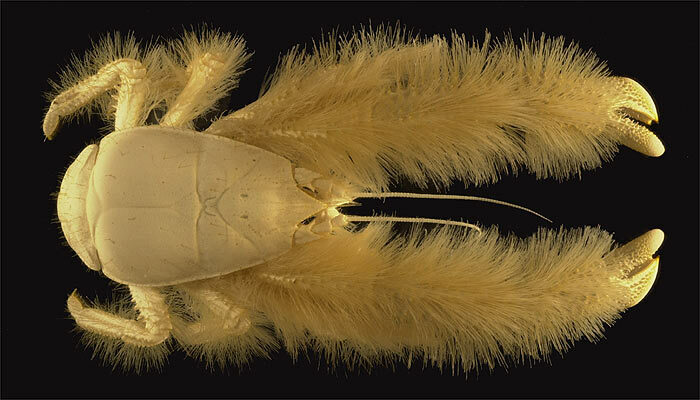 Indeed, one could call both the Squat Lobster and the Hairy Kiwa "living fossils," as they retain certain primitive features no longer found in other living species. I'm Moving. Can I Bring My Crays? i am moving out of my ex wife's house (love stinks) and i want to bring my oh so precious crays with me. i was thinking of syphoning about a quarter of the water in my crays' tanks in individual buckets and then putting them in the tank in my new place plus some fresh water. i'm kind of lost on what would be the most sound way of doing this...any suggestions? Moving can be a traumatic time for crays and indeed all species of crustacea. Given proper preparation, however, you can minimize the impact the move has on your little fellow. How you transport your cray depends on how far you're moving. If you're no farther than an hour from your new destination, you can allow your cray the freedom on perching on your should as you drive. You'll be able to tell it's having a good time as it sways his claws in the air along to the rhythm of the radio or some car songs you and your family might sing. Just remember to dropper it with water every few minutes lest it dry out. Longer trips require some sort of water for the cray to rest in. A cray traveling over an hour should be accompanied by a five gallon bucket of water filled all the way to the top and sealed — and don't be afraid to pound the lid on with a rubber mallet or hammer. You may want to throw a few food pellets in with the cray. If it seems especially jumpy, grind and add a motion sickness pill or two to the water. Long-distance moves that involve cross-country driving or flying are best done through airmail for the crayfish. With the following steps you can ensure your cray will meet you at your destination alive and healthy. Reduce the temperature of your tank by a few degrees a day over the course of several weeks until it's near freezing. (Colder climate crays' temps can be lowered a little more rapidly than tropical species.) You can plan on feeding them less during this period, as their metabolism will slow and you don't want to soil the water. Call your local United States Postal Service branch and ask about sending items requiring refrigeration (but don't tell them it's a live animal!) The night before you're due to ship, keep the cray in a bowl of water in your refrigerator. At this point it should be almost catatonic. Using the special packaging and cold-packs specified by the USPS, carefully wrap your cray tightly. I recommend sealing your cray in a plastic baggy filled with water and arranging several cold-packs snugly around it until the padded box or envelope you're using is tight. Ship your cray so that it will arrive a day or so after you do. The sooner you release your cray from its packing the better, and it wouldn't do to let it sit at your front door day after day waiting on your arrival. You might need to talk to your USPS branch about rates and shipping times. Optimally you will have shipped your tank's gravel and decorations as well, in which case you can just add these to the tank. Make sure to use cold water at first because too much of a change in temperature could shock your cray. After a few hours, your cray should come to life. With the right planning and care, your cray will survive the move mostly intact, ready to help you settle in at your new residence.